I am exporting a map from QGIS. I have some text labels for the title of my map, rendered with html. All looks good before I export but when I open my exported map (I have tried exporting to both PDF and image), the map title has completely moved to the side and is partly off the page altogether. The picture below shows the output for the bottom of my map where the title is and you can see it is cut off. It is supposed to say ONEROA. and the other lines are missing letters as well. 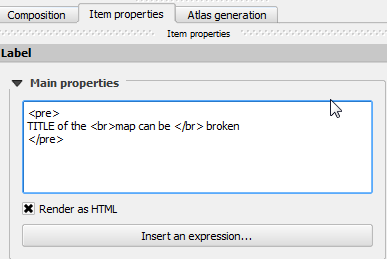 I had experienced trouble with finer details of my text outputs from the composer in QGIS. In most of the cases, I fixed problems like you are having using the actual HTML tags. In the text box properties of your title in the composer window, try inserting the HTML tags you want and try the outputs which most probably will fix the problem. You can try using any other common HTML formatting tags to control your texts to finer details. Hopefully, you will get your outputs in your desired formatting. Not the answer you're looking for? Browse other questions tagged qgis export print-composer text or ask your own question. How to lock map labels for inset map in Print Composer? Exporting map containing raster layer with vector field symbology ends up with partially rendered symbology from ArcMap?